Get your free issue tracking template! When you’re talking about an issue in project management, you really mean a problem, but specifically a problem that is related to a project. This problem may be about to happen or is currently happening, but it must be resolved as quickly as possible or else risk the whole project. An issue, however, is different from a risk in a project. A risk basically is something that hasn’t occurred but may disrupt the project. An issue is imminent or occurring. It’s a somewhat subtle distinction, but one that demands attention. That’s why our free Excel issue tracking template is a great start to corralling and correcting issues as they arise in a project. 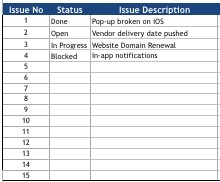 Once you download and create your own issue tracking template you can collect those issues. First you have to identify them, of course, and the template is where they go. Only after having identified them can you begin to create some plan of action. Use your project team to brainstorm ideas. Collaboration is a great tool for tackling a problem as it gives you many different perspectives and comes from experience and skills you may not have. How you address the issue is as open-ended as how many issues may arise in a project, which is more reason you need a place to collect these ideas. 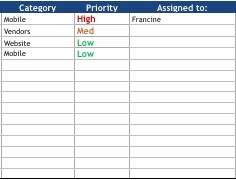 The issue tracking template makes sure that everything you do is clearly documented. How that action is going to resolve the issue could be a change of scope or requirements, but whatever that may be you’ll need to define it, negotiate it and have it approved. Then you can add it to your template. You’ll want to implement that action quickly, and the risk tracking template allows you to do so systematically and clearly. The template is great, too, for multiple issues and keeping them all straight. You’re likely to have more than one issue in a project, so you need a document to keep track of one and all. Once you’ve got your free Excel template and have downloaded it, you’ll want to create one to suit whatever issues you’re having on your project. The first step is filling in the blank fields with the pertinent information. This is where you list your issues, so you’ll want to number them first to keep them from getting confused. Then there’s a column in which you can note the status of the issue. Is is done, in progress, open, blocked, etc.? Of course, you’ll need to describe the issue, and be precise but not wordy. What’s the Category, Priority and Who’s the Issue Assigned to? Depending on the issue, the category is going to be different from issue to issue. For example, the issue may be with a vendor or a website build. Whatever it is, here’s the place to put it. Then you’re going to need to prioritize. Is it high, medium or low priority? Note that. Then, assign the issue to someone to oversee its path towards being resolved. If you don’t, the issue will undoubtedly be lost in the shuffle. It’s good to note who raised the issue. That may help resolve it. There a good person to go back to, even if they’re not the one who will own the issue. That’s why you want to write it down here. The date the issues is opened and closed is also helpful when tracking, so there are columns for both. Finally, you’ll have a column in which to add comments that don’t fall under any of the already assigned columns. Issue tracking works best when it’s part of the whole project management solution. By pulling in team members to not only raised the issue, but will lead the task to resolve them, you’re making it more likely that the issue will not fall through the cracks. When this part of your project tracking solution is part of a larger project management software tool, then you’re managing issues, rather than have the issues drive your management of the project. When you’re in the ProjectManager.com software suite, go to the top left-hand corner of your page and click on the pull-down menu. There will be an option to import, select that. It will then open up another window in which you can scroll down and choose the import issue. Click that. A new window will pop up asking you to select the file you want to import. ProjectManager.com can import both Excel and CSV files, though they have to have certain required columns, but you can add them in the process of importing. Then just click the import button and your issue tracking template will merge with the ProjectManager.com software, making it easier to edit and share. The ProjectManager.com software makes it easy to follow your project issues.They’re all collected under the issue tab in your individual project, with functions to share or trash as needed. You can simple search and export with a keystroke, or clink the link to go direct to that issue page. Once you’ve selected an issue, a window to the right gives you an easy interface to edit everything, from the description and date the issue was raised, to the type of issue it is and what that status is of the issue. You can add files to the issue as necessary, too. All in all, this one stop makes tracking and editing your issues that much easier. Issues are problems, but that’s merely a quick and easy why to describe them. There’s much more about managing and tracking issues, and if you want to take a deep dive into the topic, then there’s no better place than the ProjectManager.com blog. To get you started, we’ve selected the top three articles and tutorial videos on the subject, which are listed below. Now that you’ve downloaded your free Excel issue template, you’ve created one to use for your project and you’ve seen how these documents are critical pieces of project management, are you ready to take the next step? A standalone, static template is helpful, but it can be so much more useful, efficient and productive when part of a suite of project management software tools. ProjectManager.com is a cloud-based, online software that offers project managers and their teams the tools they need to work together and get the project completed faster, better and cheaper. Not only does it have features to track issues, but there’s so much more. From planning, monitoring and reporting on the project, ProjectManager.com sees you through every phase in the project’s lifecycle. Our award-winning software has been rated #1 by Gartner’s GetApp in its project management app category, which is collected by actual users of the software. Why not see for yourself what ProjectManager.com can do for you and your team by taking this free 30-day trial.